What is stopping us increasing our renewable energy ambition? Can we increase our renewable energy ambition significantly beyond 2020? Not if we continue to focus on just one aspect of renewable energy, namely renewable electricity and continue to neglect renewable transport and in particular renewable heat, writes Director of the national SFI MaREI Centre, professor Brian Ó Gallachóir. Can we meet our 2020 target? In 2017, renewable energy in Ireland provided 10 per cent of our energy usage. We are not on track to meet the mandatory 2020 target, under the EU Renewable Energy Directive, of achieving at least a 16 per cent renewable energy share of our overall energy usage. We are likely to comply with the Directive requirements by i) increasing renewable energy in Ireland to 12 per cent or 13 per cent; and ii) purchasing renewable credits from other EU Member States. Our most significant progress in recent years has been in increasing wind energy deployment with renewable energy in 2017, accounting for 30 per cent of our electricity usage. However, electricity accounts for just 20 per cent of our overall energy we use, so this 30 per cent RES-E share means that renewable electricity provides just 6 per cent of our overall energy use. Significant increases in renewable electricity will not provide a significant short-term increase in renewable energy because of the low share of overall energy that electricity represents. Even if we achieved the 70 per cent RES-E ambition suggested by the Irish Wind Energy Association, this would provide us with just 14 per cent of overall energy use. Electrification of heat and transport will improve this but this takes time, requiring individual home owners and car owners to make active decisions to do so. Some progress has also been made in increasing the share of biofuels in road transport with the successful implementation of the Biofuel Obligation Scheme. It is very important that further progress is made here as transport accounts for 43 per cent of energy use in Ireland’s renewable energy jigsaw. Heat represents 38 per cent of energy use, so this is a big missing piece. We do have some renewable heat usage, mostly in our homes and in the wood processing industry. We cannot increase our overall renewable energy ambition significantly beyond 2020 without the effective increase in renewable heat. We have a new support scheme for renewable heat which will need to be implemented quickly and effectively. While heat and transport account for 80 per cent of energy use and provide the greatest potential for significant renewable energy growth, they have largely been neglected in much of the public discussions on renewable energy and in terms of policy development. This is despite the fact that increasing the share of renewable heat and renewable transport energy also contributes to Ireland meeting our mandatory 2020 and 2030 GHG emissions reduction target. Renewable electricity by contrast contributes nothing to our mandatory EU emissions reduction targets because the targets relate to sectors outside of electricity and large industry. According to the EU Renewable Energy Directive (i.e. Directive 2009/28/EC), Ireland is required to achieve a minimum share of 16 per cent of overall energy use (16 per cent RES) by 2020. The EU has an overall target of achieving a 20 per cent renewable share of energy use by 2020. In 2016, the EU had reached a 17 per cent share of energy from renewable sources. Similar to Ireland, the EU has 30 per cent of its electricity from renewable sources and this represents 6 per cent of overall EU energy. The share of transport and of heat energy from renewables is greater in the EU than in Ireland, which accounts for the higher share within the EU. Within the Renewable Energy Directive, there is a significant range of targets across the member states, ranging from 10 per cent for Malta to 49 per cent for Sweden. In addition, each member state has a mandatory target to achieve a minimum of 10 per cent of road and rail transport energy from renewable sources (10 per cent RES-T). There are specific limitations on the use of biofuels with respect to meeting this target. Biofuels can only be counted if they meet a number of sustainability criteria that become more stringent as we approach 2020. A revision to the Renewable Energy Directive in 2015 limits to 7 per cent RES-T the level that can be provided from biofuels from ‘food’ crops. In addition, weightings are used to increase the use of biofuels from waste and from second and third generation biofuels and to encourage the penetration of electric vehicles (and the increased share of renewable energy in electricity to charge them). To measure the contribution of these favoured biofuels towards the 10 per cent RES-T target, their energy contribution is increased by a weighting of two. The renewable electricity portion of electricity used to charge electric vehicles is also increased, by a weighting of five. It is important to note that these weightings apply to the RES-T target only and not to the overall RES target. A newly revised Directive is being drafted, focusing on the 2030 EU ambition of achieving at least a 32 per cent renewable energy share of energy use. The new Directive will not set mandatory member state targets. These will be developed by member states themselves and set out in the National Energy and Climate Plan that each member state needs to submit to the EU by the end of 2018. Regarding the 2020 targets, it was up to each member state to determine how they will meet their overall renewable energy target, in particular how much will be delivered by renewable electricity, by renewable heat and by renewable transport. Ireland’s National Renewable Energy Action Plan (NREAP) establishes that the 16 per cent RES target in 2020 will be delivered by achieving three modal targets, namely a 40 per cent renewable share of electricity use (40 per cent RES-E), a 12 per cent renewable share of heat (12 per cent RES-H), and a 10 per cent renewable share of transport energy (10 per cent RES-T). While all of these modal targets pose significant challenges, the primary focus of discussion and policy development has been on achieving the 40 per cent RES-E target, which is sometimes incorrectly referred to as “Ireland’s renewable energy target” or as being “mandatory” in the context of the EU Renewable Energy Directive. The development of renewable energy in Ireland since 1990 is illustrated in Figure 1, where the share of energy use is shown, quantified as per the EU Renewable Energy Directive definition. 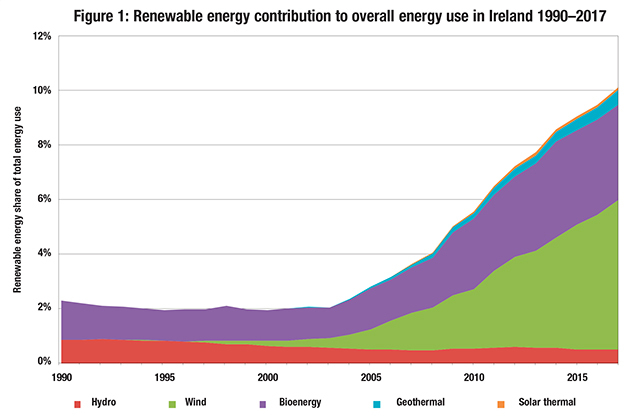 During the 1990s, Ireland’s renewable energy contribution remained low (approximately 2 per cent), dominated by biomass use and hydro power. This was largely due to the use of waste wood for heat in the wood processing industry and due to the roll-out of hydro power in Ireland in the 1950s as part of the rural electrification programme. It is also evident from Figure 1 that in the period since 2003, there was a significant growth in wind energy that has made a key contribution to the overall RES growth to 10 per cent of energy use by 2017. This represents a significant policy success story that was driven by establishing a clear target, by achieving collective buy-in to a strategy that was formulated with key stakeholders and through continuous adjustments as required of market support measures, grid connection policy and planning process. It is less evident from Figure 1 that biomass has also grown (although clearly not as significantly as wind energy) in this period, due to an increase in biomass for heating but also more recently due to the growth in biofuels in transport, the latter also stimulated by policy support, most notably the Biofuels Obligation Scheme. 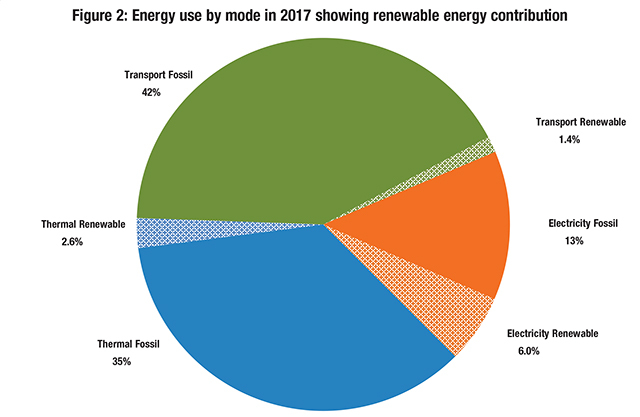 The contribution of the different modal shares of renewable energy (i.e. in electricity, heat and transport energy) to the overall RES share of 10 per cent is shown in Figure 2. The significant growth in wind energy has resulted in renewable electricity now representing 30 per cent of Ireland’s electricity use and 6 per cent of overall energy use. Renewable heat (largely bioenergy in the form of wood) represents nearly 7 per cent of Ireland’s thermal energy needs and 2.6 per cent of overall energy use. Renewable transport energy in 2017 accounted for approximately 7 per cent RES-T (or 4.2 per cent if the weightings that apply to biofuels from waste are excluded, pointing to the significant proportion of biofuels from used cooking oil). This contributed just 1.4 per cent to overall RES as shown in Figure 2. Summarising the relationship between modal renewable energy shares and how these contribute to the overall renewable energy share of energy use. How can we significantly increase our renewable energy share by 2030? The Irish Wind Energy Association has proposed that Ireland’s renewable electricity target should increase from 40 per cent in 2020 to 70 per cent in 2030. EirGrid’s 2017 Tomorrow’s Energy Scenarios analysis provides scenarios where renewable electricity represents between 47 per cent and 75 per cent of electricity use by 2030. In both the IWEA and EirGrid high RES-E scenarios there are also ambitious assumptions regarding the level of electrification of heat and transport. Despite the ambition underpinning these scenarios, these RES-E would equate to a 14 to 16 per cent share of overall energy use from renewable electricity. Clearly, significant increases in renewable electricity are necessary but not sufficient to move to an ambition beyond a 20 per cent renewable share of energy use. This requires significant increases in renewable heat and renewable transport. It is also worth noting that the 2020 40 per cent RES-E target requires EirGrid to be able to accommodate a 75 per cent share of wind and solar instantaneously (known as the SNSP limit). Growing from the current 60 per cent to a 75 per cent SNSP limit by 2020 is already challenging without seeking to go beyond that level. A very significant increase in the SNSP level beyond 75 per cent would be an essential prerequisite to achieving a 70 per cent RES-E level by 2030. The most significant obstacle to increasing our renewable energy ambition is the lack of attention given to renewable heat and transport. Regarding renewable transport energy, the biofuels obligation scheme is successfully increasing the share of renewable transport energy, but there are concerns that need to be addressed. Firstly, the scheme has increased the levels of blended biofuels in the petrol and diesel that we consume, with the share (of road transport fuels) by volume increasing to 8.7 per cent in 2017. However, in terms of the contribution to the 16 per cent RES target, we need to be conscious that (a) the share is lower in energy terms (than in volume terms) due to the differences in calorific values between biofuels and petroleum products and (b) weightings are applied to certain biofuels (e.g. biofuels wastes are counted twice) in terms of compliance with the 10 per cent 2019 goal that do not apply to the overall RES target and (c) when calculating the contribution to the overall RES share, all transport energy is considered (i.e. including aviation), not just road and rail transport energy. Secondly, there are limits to the extent to which blending may occur before it may impact on standard car warranties. In the case of diesel engines, ASTM International develops specifications for conventional diesel fuel (ASTM D975). These specifications allow for biodiesel concentrations of up to 5 per cent (B5). Regarding petrol engines, E10 is a low-level blend composed of 10 per cent ethanol and 90 per cent gasoline. It is classified as “substantially similar” to gasoline by the US Environmental Protection Agency (EPA) and is legal for use in any gasoline-powered vehicle. This still does allow for a significant increase in biofuel penetration (petrol to 10 per cent, diesel to 5 per cent, in both cases unweighted) although the dieselisation of the fleet will impact here as a limiting factor. There are interesting approaches under development to address this constraint including renewable diesel, based on hydrotreated vegetable oil (sometimes referred to as renewable diesel), which is indistinguishable (by the car) from diesel fossil fuel and allows significant increases in the share of biofuels in diesel. It is worth noting that the first commercial production of renewable diesel was in Ireland at the Whitegate Oil Refinery in 2007. In addition to increasing the amount of biofuels (including renewable diesel), renewable gas is another option. The role of compressed natural gas (CNG) vehicles, in particular for freight transport does not receive sufficient attention, in conjunction with supporting the upgrading of biogas to biomethane for injection into the gas network. This builds on collaborative work between Gas Networks Ireland who are rolling out CNG refuelling facilities under the Causeway project and the SFI MaREI Centre who are researching biomethane as a transport fuel. 3. changes in the fuels used for heat supply generally require the building owners to make active decisions (i.e. changing heating system to heat pump or biomass systems etc.) compared with changes in fuels used for electricity supply or indeed biofuel blending (largely removed from consumers as they happen long before the point of purchase and use). Renewable gas is an exception here as it requires no change for gas customers at point of usage. Increasing our renewable energy ambition is possible but is also challenging. 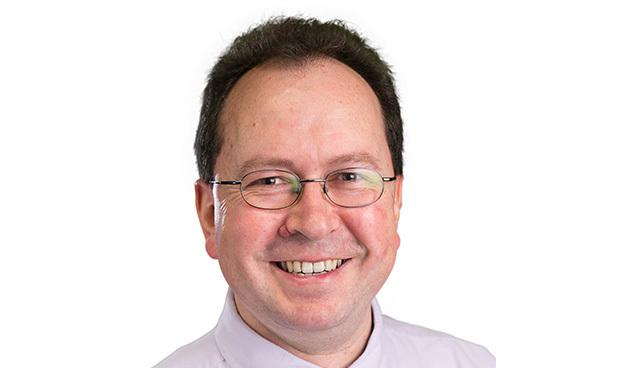 Brian Ó Gallachóir is Director of the SFI MaREI Centre and Professor of Energy Engineering in University College Cork.